Parents and adults in Australia don't like Halloween because it is 'American' and the kids eat too much candy (to which I would like to point out - they do that everyday. I know because I was a kid once). And my room-mate is on their side saying it is a stupid 'American' tradition and shouldn't be encouraged in Australia. 1) CANDY! After Easter Sunday, it is the next biggest intake of chocolate and all things sugar. 2) Outfits are awesome! Face it, there really isn't that many excuses to dress up to either scare people or show-off. 3) THIS! Which was horrifying at the time for me, but I love it. Love it, love it, love it. Go watch it, or listen to the soundtrack - it's a win either way for you. 5) It seems that many of the cultures around the world and across human history have celebrated the dead and departed souls. I have a love for all these festivals! The colour of Day of the Dead especially. So whether it is All Hallow Eve, Halloween, All Souls Day - whatever you want to call it, there is always something fun to do or see when there is a festival on, so why be so against one because of how it has been developed in a one particular country? Australian's can put their own stamp on the night as well - we have so many terrible ghost stories in Brisbane alone and look at the Australian Aboriginal to find some of the most scarist spirits and creatures around. Dress up as a Drop Bear! Wail like a Bunyip! Stomp around and jump out like the Yowie! But if people are anything like my room-mate, they won't stop whingeing until the whole thing is over. So here is some stuff I did today, 'cause tomorrow I need to start studying for my exams. Mortica, Wednesday and Marie Antoinette. For something spook-tacular. I have actually watched some of the old 1960s episodes in the past few days. I can't use watercolours to save my picture at all. I also went shopping today. Dad would laugh, and Owen certainly rolled his eyes when he looked through the bag. Dolls. 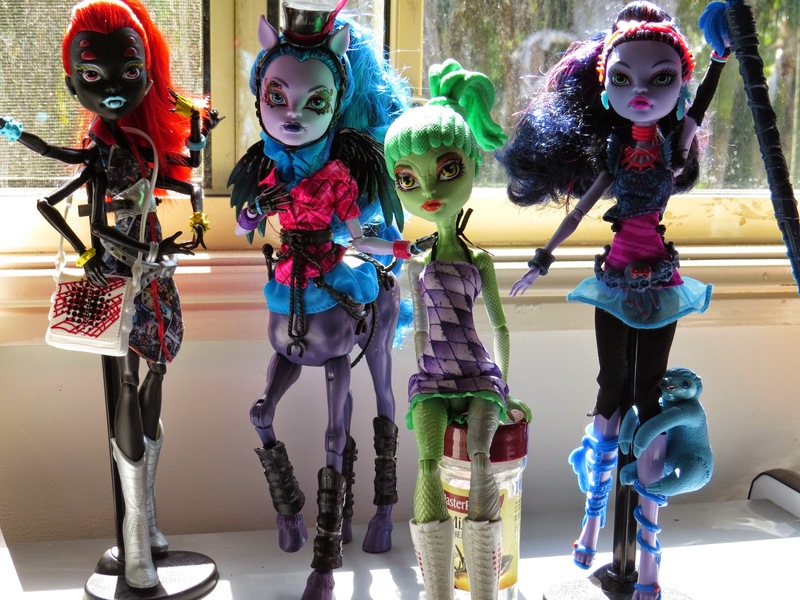 I bought Monster High dolls. The two on the left (Spider and Centaur/Harpy) are the new ones. I also bought one for Mum, but that is staying in the parcel until she gets it. I also went into Uni to a pop-up exhibition at the Antiquities Museum about Curiousity Cabinets done by some of the students/interns from one of my Classes. It was good, and I saw some of my other Uni-mates. 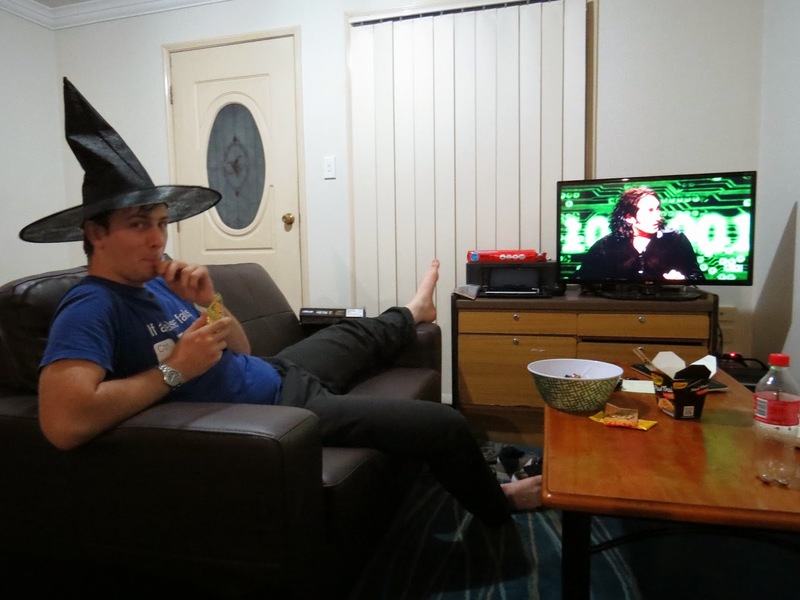 I also had Owen with me, who was clearly out of his depth (and only sticking around because I said he could have the candy I left out for trick-or-treaters when we got back and he wore the witch hat). But he did well. So here is one embarrassing picture from his candy 'haul'. Look! He did wear the hat. Watching QI and eating a Wizz Fizz. Wait, are Wizz Fizz's eaten or just absorbed? He is going to kill me after he sees this. So, now Beetlejuice is on. And I haven't seen it yet, so if you excuse me, my Halloween is just getting started (and Owen has left the candy on the table - so it's mine now). Happy Hallow's Eve and All Souls Day everyone! Have a great day and spooky night! Now I have to say, Monster's High are the best & my newbie (THANK YOU) now resides in Driftwood Studio, with me, makes me smile, she is not dis-similar to the pumpkin king in the clip, didn't connect the 2 before :) What a great idea about 'Aussie-ing' Halloween, the US put their slant on the old Celtic/pagan rituals, we obviously keep the 'trick' or 'treat' (AND WIZZ FIZZES... BTW was Owen's 'trick' looking like he joined Hogwarts LOL, funny) and using Austrailan ghosties & dressing up as everything from 'drop' bears ;) to Ned Kelly's could take on!!! Mortica, Wednesday and Marie Antoinette, a delightfully creepy (fav) family artwork, perfect as a Halloween 'treat' :) Well celebrated!